The storm clouds built Saturday evening in advance of a strong windstorm that blew through on Sunday. 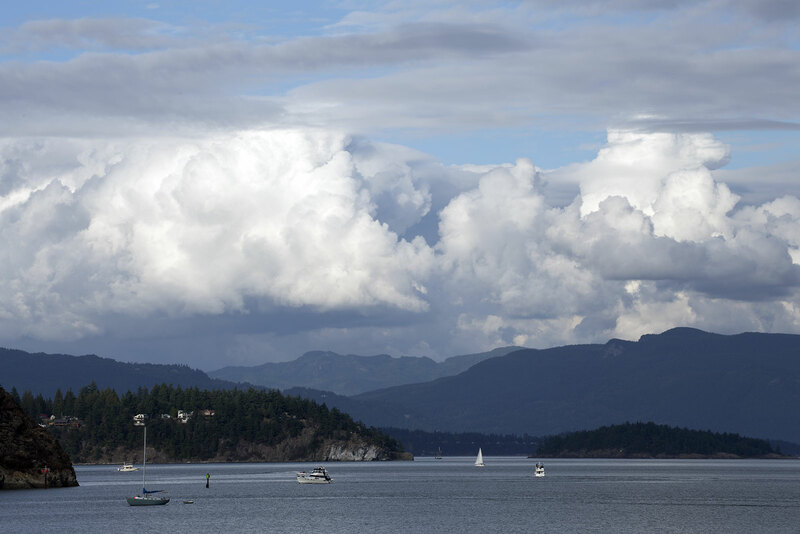 This photo was taken from the Anacortes shoreline looking east. Cap Sante is on the far left. Last Sunday we had a rather intense windstorm blow through Western Washington. Winds of 55 mph were reported on Whidbey Island, but even though we had strong wind at Anacortes Marina, it wasn’t quite as intense. Most of the wind seemed to average between 20-30 mph, with some gusts approaching 40 mph. The strong winds lasted from early morning until mid-afternoon, and were accompanied by rain squalls and some much cooler weather. The wet weather caused another delay in our waxing efforts. We’ve managed to get about half of the waxing done so far, and hope for some dry breaks in the next few days so that we can get back to the waxing. Since we couldn’t work outside, it was a good opportunity to do more planning/work on the installation of our replacement SiriusXM satellite radio. We decided to mount the new radio on the starboard side of the boat because that’s where the cable from the antenna enters our cabin. But in order to connect it to our onboard stereo system, we had to figure out a way to connect it to our stereo receiver on the port side of the cabin. The satellite radio isn’t a stand-alone audio device. It plays through our stereo system by connecting to our Sony stereo receiver. The satellite radio we replaced had connected to our stereo receiver by transmitting an FM signal to the Sony stereo, but the newer satellite radio offers the option of a direct connection from its earphone jack to an auxiliary input jack on the stereo receiver. The direct connection produces a better signal, so we decided to go that way. In order to directly connect the radio to our stereo receiver, we have to route a cable from the satellite radio on the starboard side of the cabin through the cabinetry and the engine room in order to hide the cable. We finally figured out a good place to mount the radio and the best route for running the cable. We got a good start on this project during the inclement weather, but finishing the project will take a little longer. This entry was posted in Life Aboard, Projects, Travel and tagged Anacortes Marina, cap sante, satellite radio, SiriusXM radio, Sony stereo receiver, stormy weather, strong wind by Sailor Lady. Bookmark the permalink.